1.Open the pack of soybean sauce(A). Marinate the chicken in soybean sauce. 2.Pour the sesame oil(B) into the pan and fried the chicken until it's well done. 3.Completed by pouring the 3-cup sauce pack(C), dried chilli pack(D) and fresh segmented green onion into the pan and keep stir-frying to make the sauce thickened and absorbed. Ingredients: Sauce Sachet (C): Water, Soy Sauce (Soybean, Wheat Flour, Water, Salt) (14.08%), Ginger, Garlic, Crystal Sugar, Shallot, Chilli, Sesame Oil, Rice Wine, Basil. Flavour Sachet: Soy Sauce (Soybean, Wheat Flour, Water, Salt) (A), Sesame Oil (B), Dried Chilli (0.7%) (D). 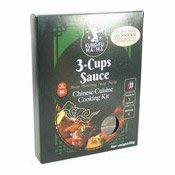 Simply enter your details below and we will send you an e-mail when “3 Cups Sauce (功夫媽媽三杯醬)” is back in stock!